Late last night several people were attacked in central Malmö by members of the fascist Svenskarnas Parti (Swedes Party). They were on their way home after having taken part in celebrations for International Women's Day. The attack on the 8th of March demonstrators can't be seen as an isolated incident. The arson attack on Kvarnby peoples high school in October 2013 was only the beginning of an escalation in nazi violence around Malmö. Left wing locales and premises have been exposed to graffiti and broken windows. In January a 16 year old member of SSU (Sweden's Socialdemocratic Youth organisation) was attacked by two men, warning her about spreading her views. In several other places and cities nazis have been identified registering participants in demonstrations during International Women's Day. The seriously injured 25 year old, who is currently being cared for in a sedated state in hospital, is a leading figure in the fight against racism and homophobia in the football world, a SAC member and devoted supporter of Malmö FF. He also helped to found "Football fans against homophobia". Based on this, he has been recently hung out on the Swedes Party linked website 'Realisten'. According to witnesses at the scene, a high ranking member of the Swedes Party - Andreas Carlsson, was involved in the attempted murder. He was seen attacking feminists with a knife. Andreas Carlsson is one of the members of the Swedes Party who travelled down to Kiev as "Ukrainafrivilliga" (Ukraine Volunteers) to support the Svoboda party's efforts in taking power. On Realisten he has reported on the Swedish Nationalist delegation's operation.Some of the delegations participants have stayed, according to their own reports, "to enlist in the Ukrainian army", while Carlsson's group returned to Sweden only a few days before the 8th of March. The Security Services' (Säpo) chief analyst Ahn-Za Hagström claimed on the 8th of March that they "see no increased intention or capability of committing politically motivated crimes when they get home." (SR.se March 8th) That same evening the nazis attacked. Foreign Minister Carl Bildt said in a recent interview on Swedish Radio's P1 channel that the Swedes Party's sister party Svoboda are "European democrats who work for values that are ours". This minimization and normalization of fascist parties has given the Swedes Party and their "Ukraine Volunteers" the belief that they have a free pass for their violent acts. Not only the Security Service, but also the ordinary police have ignored the far-right violence, by depicting the murder attempt as a "gang war" between "opponents on opposite fringes". 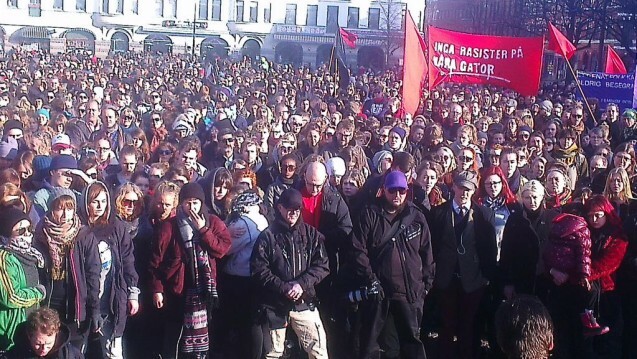 This comes less than half a year after police ignored warnings that a similar nazi party, Svernska Motståndsrörelsen (The Swedish Resistance Movement), planned to attack the anti-racist demonstration in Kärrtorp. It is abundantly clear that the fascist threat against Sweden and Europe, against individuals and social movements, is not taken seriously. Neither the government, the security services nor the police have been able to present a clear and coherent approach towards this. Fascist violence should never be reduced to youth fights or extreme phenomena, such as, Birgitta Ohlsson's government extremist investigation. Then one misses the powerful political force that the fascist parties in Europe have become, the impetus it gives the corresponding parties at home in Sweden and ignores the seriousness of the weapons training and street fighting skills Swedish right-wing extremists have gained during his travels and visits with Jobbik in Hungary, Svoboda in Ukraine and the Golden Dawn in Greece these last few months. Those who consider today’s Fascistic articulation and socio-political experiments, which is running through whole Europe, to the ideological and street engagements of 80s and 90s, need to do, at least, some library home work; systematic crisis of capitalism can open the way both for a eventual proletarian perspective and at the same time a savage approach to the problem of crisis, which is historically fascism in power position and/or generalised war scenario. Hope mankind, we , don’t need to go back 4-5 millenniums in history. Some update about his condition? Yesterday Showan moved on his fingers and feet. The doctors were preparing gradually wake up by lowering the dose of sleeping medicine. Today, he touched his tongue, moved the entire arm and even coughed. Please pray that everything goes well now. Just wanted to post this. There haven't been many updates that I am aware of on Showan, but since he came out of sedation over a week ago the signs have been good so far. I also want to come back to what I mentioned in the article on the attack on a demo by Nazis in Kärrtorp, Stockholm in December. There's been quite a media war in the time since March 8th. Some great articles but the majority of the coverage by the liberal media has astonishingly (or perhaps not so astonishingly but rather despicably) focused on left extremists and leftwing violence. What I wanted to get back to and still don't have time to do properly has been the government literally equating right wing, left wing and islamic extremism. Not just in the media but also officially by government "expert" groups. This isn't new for a lot of european countries but an interesting development nonetheless and one which will have consequences for many groups and campaigns. It is expected that there will be an upswing in this media war over the next while, especially around upcoming courtcases coupled with it being an election year and the general atmosphere right now. That said there are some interesting developments taking place, both in terms of local organising and groups working together.